Exhibitions are a great opportunity for a business to generate sales, build a positive brand image and stand-out amongst competitors. Your choice of a display stand plays an enormous role in your overall success at an exhibition event. 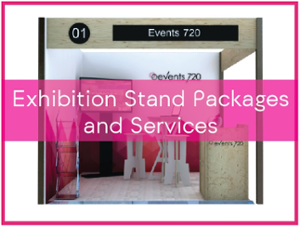 At Events 720, we understand the importance of your display stand and the need for it to reflect your brand. Therefore, our products are made with high quality materials by our team of experienced builders. If you are an exhibitor at an event where Events 720 is the main exhibition supplier, you explore the wide range of products we have on offer. If you want a creative and show-stopping custom exhibition stand, we have the skills and expertise to design and build a great stand that will help you attract visitor attention and achieve your goals. We have a fantastic range of rental equipment and stands available to exhibitors who want fast and cost-effective results. 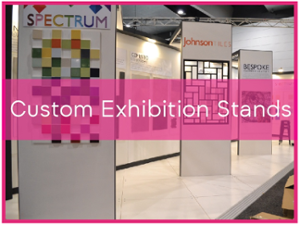 Simply click on the icons below to find out about our Custom Exhibition Stands. Or view our range of furniture and AV hire in our Exhibition Stand Packages, as well as any further stand accessories you may need during the show to make your experience worthwhile. No matter how big or small, we have everything you need to make your exhibition a success. If you’re unsure where to start, our team are always on hand to recommend the best solutions to fit your exhibition goals and your budget. Get in contact with us today and we can help you get started in the right direction. Need some specific help? We can assist with all your exhibition questions.